Centrally located hotel at Jaipur, close to M.I. 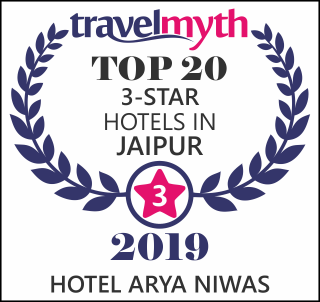 Road and the old Pink City, Arya Niwas is a renovated Heritage Haveli offering nicely furnished rooms, peaceful gardens, verandahs, courtyards and a vegetarian restaurant. Our 100 plus year old central hall with its beautiful frescoes in natural colours, large front lawn with its soothing atmosphere, home like food and reasonable prices make Arya Niwas an attractive hotel to stay for Foreign as well as Indian guests, executives on work as well as families on vacation. Family managed, we care for the things that matter! Specially designed wheelchair friendly rooms and public areas. Special attention for single lady guests travelling alone. No charges for small kids, half charges for 5-10 year olds. Special discounts for long stays and repeat guests. Restricted entry to persons not staying with us. Entire building is CCTV covered. Family Managed, we are particular about visitors from outside. No BAR, pub and discotheque/nightclub. Owner's female family members are actively involved in the management of the hotel. There is no bar / nightclub / disco on premises. Home like food freshly made. Special dietary requests for old / sick guests and children are welcome. Yoga classes held on request. Breads, cookies, preserves made without using chemicals, artificial colours or preservatives in house. Great value breakfast & dinner buffets. Chemical fertilizers are not used in gardening, harmful pesticides are used minimally.